Everyone has its own concept of GOA. For me it is one of the best places where to spend your vacation and refresh your mind. And it is especially fun to be in such a place with friends and family. 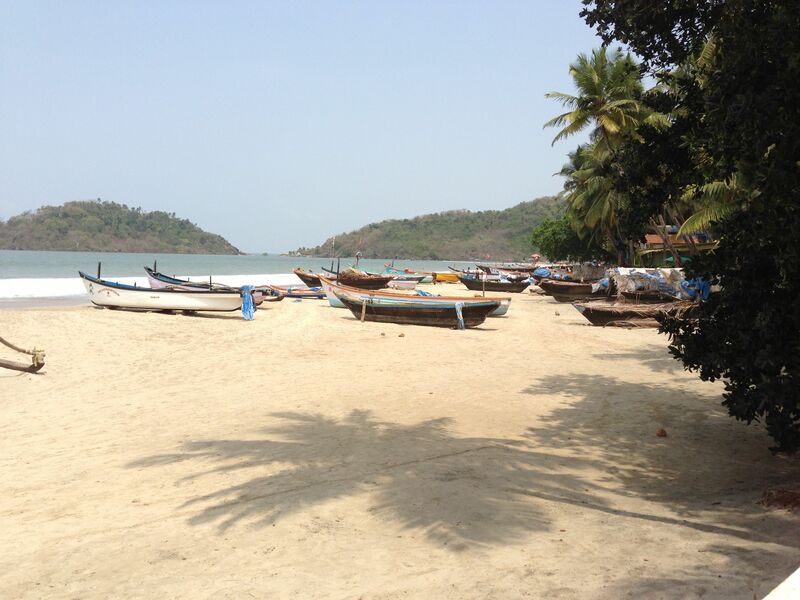 I have been to Goa 3 times and this time it was one of my most memorable trips. I had just finished the 1st year of my Bachelor’s degree and was eagerly waiting for my results. It was my term break and I was with mom (Marie-Helen) and Carole in GOA. This trip had been planned long time before. Shanker and I first arrived then the following day, Mom and Carole joined us. The trip started off on the wrong foot! Because of a taxi that we had ordered but which never came we nearly missed our flight from Bangalore. We reached the airport when the boarding procedure started, let’s say 5 minutes before…We thought that there was no chance that we would catch the plane but we made it through!!!! So we managed to arrive in GOA safely. Shankar and I were alone in that first evening and we felt awkward going to a restaurant alone. But the next day mom and Carole arrived from Nepal. Then two days later, Shree brother arrived from Pune and then Samjhana came from Bangalore. So we were the six of us. 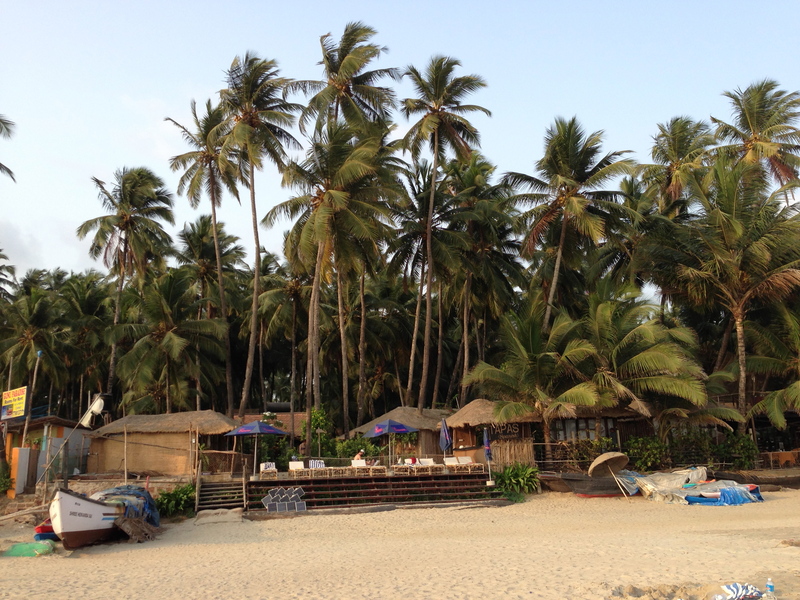 We stayed at Palolem Cottage for one week. We had a very hectic holiday schedule! The first day we played on the beach. The weather was very hot and the day was sunny and bright. The second day we went for boating which was Carole’s idea, a great idea!! It was one of the best activities we had. We really enjoyed it and it was fun to play on the boat. We laughed, we fought. We threw water at each other’s faces!!!…. It was salty water so it burned our eyes but still we were having so much fun that we didn’t care at all. When we came back to the beach we had snack at our usual restaurant, i.e. Sameer Restaurant, where the food is good and the waiters so friendly. Every moment is engraved in my memory! Time flew so fast. Samjhana and I kept ourselves busy by collecting shells on the beach and Carole helped us gathering and storing the sea shells. We used to swim mostly after 2:30 pm because waves were too high during the midday hours. Carole played with us on the beach. The only regret that I have is that Shree brother had come just for one day, as he couldn’t take a leave of absence from his work. We all wished he could have stayed 1 day more. Carole left 2 days before us and we were missing her a lot. It was fun when we were all together. Jyoti and Samjhana already playing together in 2000 ! It was such a wonderful trip and I was so happy to spend some time with mom after such a long time. Actually, there was no plan for me to go to GOA, as from May 8th to May 13th, when mom had planned to be in GOA, I was having my second sessional exam. But very luckily for me, my exam got postponed at the last moment and I could join the trip to GOA. I am grateful to mom as without her phone call to Bangalore I would have missed this wonderful trip. The sad part about this trip was that I had to travel alone from Bangalore to GOA. Indeed I was having my regular classes till May 10th, and Jyoti and Shanker flew to GOA on May 8th, as their tickets had been bought long before. So I flew on May 11th, alone!! But after all it was not such a bad experience!! I reached GOA and the climate of GOA was similar to that in Bangalore. I met mom and Carole and, of course, Jyoti, Shanker and Shree brother. Shree brother came to meet mom but just for the week-end as he couldn’t take a leave from work. Time just flew away on the first day. On the second day, we went boating and that was a great experience!!! We enjoyed a lot on the boat and took many pictures. It was also a great experience swimming in the sea which was for me the first time ever!! Ready for the boat trip ! Boat trip and fun ! Together for a good Milkshake ! On the third day, after having breakfast, we went swimming again and in the evening Shree had to return back to Pune where he works. Me, Shanker and Jyoti went to drop him at the bus station. On the fourth day we did… guess what??? Of course, we went SWIMMING!!! That was the day when Carole left. She had planned to go swimming early in the morning before eating breakfast, and we were supposed to go with her. But we had a very lazy start to the morning and she had to go alone!! Then Carole left and it was little boring without her and Shree brother. We missed Carole’s jokes a lot!!! By the 5th day we were firmly entrenched in our routine i.e. swimming and walking on the beach at the evening time. But then our turn to go came too. We were very sad to leave the peaceful and beautiful beach of Palolem; on the last day we woke up so early and we went for a long walk on the beach. We took many pictures and video of each other, had breakfast and got ready to leave GOA. Shankar with his sunglasses ! Suddenly we were back in Bangalore on Thursday. On Friday I was having my regular classes again. On Saturday, we had plan to have lunch with Benjamine but I was so unlucky, I couldn’t join them, as there was a program called « Aspiration day » going on in my university. And it was compulsory for all the students to be present on this day dressed in formal wear. Aspiration Day – Samjhana wears a blue dress !